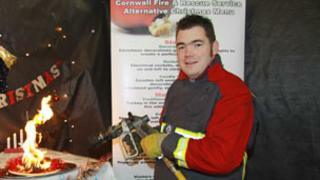 An alternative Christmas menu has been created by Cornwall Fire and Rescue Service to warn of fire dangers over the festive period. The brigade said over the past five years, most of its call-outs between 10 December and 10 January have been to kitchen-related fires. The menu, which includes "Sozzled Chef" and "Cindered Pudding", has been backed by chef Nathan Outlaw. He said it highlighted the pitfalls, and got the safety message across. The menu was the idea of Dan Fitzpatrick, a crew manager at Bodmin. "I was scratching my head and trying to come up with something different," he told BBC News. "Leaflets go out every year and don't think people notice them any more. "This a bit tongue-in-cheek but I hope it makes people look twice." Other items on the festive menu include Socket Soup, Candle Surprise, Chimney Fire Fondant, Traditional Charcoaled Turkey. Nathan Outlaw said the menu was a novel approach of dealing with a serious subject. "We all associate Christmas time with cooking and enjoying delicious food but it is important to remember that with so much going on, it can be easy to get distracted," he said. "A few simple precautions can make all the difference between having a happy and safe Christmas and a Christmas remembered for all the wrong reasons." The menu has been distributed as a poster to schools, through community fire stations and is on Cornwall Council and the fire service's website.